Found this on a FaceBook news feed, and it certainly resonates with what many in the Kingdom of Hawai’i have felt, and known, for over 120 years. It also gives a glimpse into how much (not all) of the military “takes care” of the land on which its bases are located (this does not refer to many in the US military who DO care). It also is very important for island nations like the Kingdom of Hawai’i, as each example of island locals standing up for their sovereignty, as Okinawans have done, is felt on every single US-CORP-occupied Pacific island. “The Japanese prefecture of Okinawa has elected a new governor Takeshi Onaga who is strongly opposed to the US military being on the island. Okinawa has been home to the American military since 1945, with around 26,000 troops there at the moment. There is a widespread local hostility to the American military, along with complaints of a greater accident risk, more noise, and a growing crime rate. “The main controversy now is a plan to re-locate the Futenma air base to Camp Schwab in Henoko which was approved by previous Governor Nakaima. Onaga has promised to veto the landfill work needed for the new base to be built and insisted the base should be moved away from Okinawa. “Residents are just very tired of the presence of the American military. Environmentally, the area where they are going to build a base in will have an enormous impact on the local wildlife particularly. 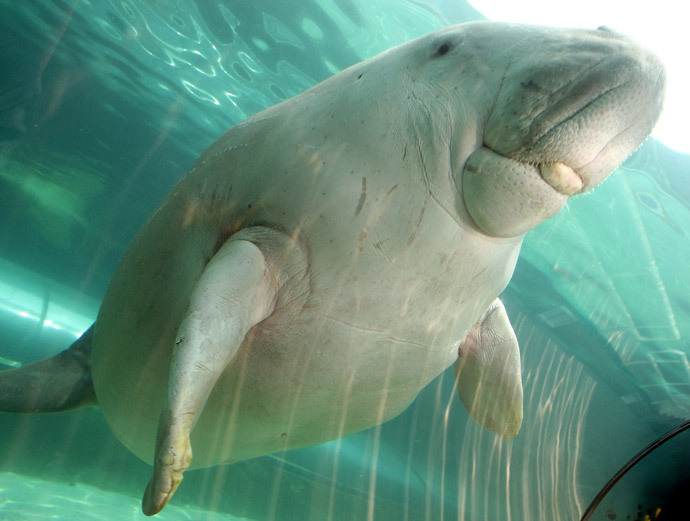 The dugong, which is a sea mammal and this, is the area where it breeds and it’s an endangered species. “RT: What influence could the stance of Okinawa’s new governor have on Japan’s relations with US, considering the US is now pivoting towards Pacific? Residents of Okinawa are concerned about the US military presence on the island, and the increasing crime rate linked to that, as well as the enormous impact on local wildlife, Conn Hallinan from Foreign Policy in Focus told RT. 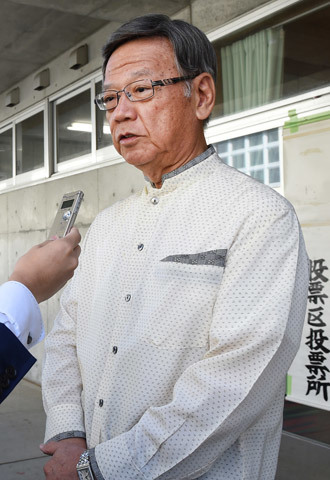 The Japanese prefecture of Okinawa has elected a new governor Takeshi Onaga who is strongly opposed to the US military being on the island. Okinawa has been home to the American military since 1945, with around 26,000 troops there at the moment. There is a widespread local hostility to the American military, along with complaints of a greater accident risk, more noise, and a growing crime rate. The main controversy now is a plan to re-locate the Futenma air base to Camp Schwab in Henoko which was approved by previous Governor Nakaima. Onaga has promised to veto the landfill work needed for the new base to be built and insisted the base should be moved away from Okinawa. RT: Can those living on Okinawa be 100 percent sure there will be no US base relocation while Takeshi Onaga is in office? Conn Hallinan: I don’t think so. The governor can slow down the process; it’s filing a lawsuit on environmental issues and urban impact issues. But he is the governor of a province and if the Abe government in Tokyo insists that this base is going to be built or it’s going to be relocated, the governor can’t really stop it. It doesn’t mean that it is going to be easy to build the base but the final decision rests with the Abe government in Tokyo. RT: What are the main arguments against the presence of the US military on Okinawa? CH: There is a series of arguments and that kind of depends on who you talk to. Local residents are very concerned because they feel like they have the bulk of the American bases in Okinawa – about 26-27 thousand military personnel. There are several large bases; there is a lot of pollution. The military is pretty sloppy when it comes to environmental impact and a lot of stuff, that is the pollutants, is very dangerous stuff. There also have been crime rates; there were a couple of rapes. It’s just these very small urban areas, larger urban areas which these bases are right in the middle of; there have been several plane accidents and things. Residents are just very tired of the presence of the American military. Environmentally, the area where they are going to build a base in will have an enormous impact on the local wildlife particularly. The dugong, which is a sea mammal and this, is the area where it breeds and it’s an endangered species. RT: What influence could the stance of Okinawa’s new governor have on Japan’s relations with US, considering the US is now pivoting towards Pacific? CH: I think it is going to have a great effect. It’s really sand in the gears. Okinawa is an enormously important base for the US, in fact, it’s the single most important base in Asia, it’s even more important than bases in Japan in part because of the location where Okinawa is. It was critical for the Korean War, it was critical for the Vietnam War. The “Asia pivot” very much depends on Okinawa; there is only so much hardware you can put in the place like Wake or a place like Guam. So Okinawa is critical here. The fact that the Okinawans don’t want this base here just sort of raises serious political questions about the whole idea behind the pivot. It also increases tensions, certainly, with China. RT: How likely is it that Tokyo could press Onaga to continue the relocation of the base on the main island? CH: They can force it if it comes to that. They can force the base to be built. I don’t know exactly how they would do that. Okinawa is the poorest provinces in Japan, Okinawans very much feel that they have been discriminated against; they’ve borne the brunt of the American military forces. They are sick and tired of it. The vote wasn’t even close, it was overwhelming, and it was close to 4 to 1 for the election of this governor. The Abe government can force the base to be built but if I were them I wouldn’t try doing it because Okinawans are staunch. I think you are going to see a lot of demonstrations, civil disobedience; it’s going to be a mess. Gallery | This entry was posted in apocalypse, chaos, energies, new energies, partners in contrast and tagged Okinawa, US military. Bookmark the permalink.